Candlesticks are the components of candlestick charts which convey or communicate price movement. By studying the candlestick patterns, one would know the price action or the movement of a currency pair over a given time period. Candlestick charts are based on the period of time over which they convey information; can be classified as hourly, daily, weekly charts and so forth. There are a variety of candlestick patterns that have come up over time. Candlesticks are vital in trading as they give traders an insight into market emotions; the reactions of dealers regarding certain changes in the market. Candlesticks therefore are very important trade indicators and should thus be carefully utilized. For candlesticks to be relied upon, they have to display consistency. Among the many candlesticks patterns employed in the market today, the following are considered the most consistent in terms of price action and trend communication. 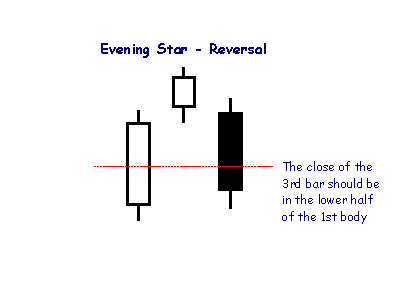 This candlestick pattern is a bullish reversal pattern meaning sellers are slowly losing their market dominance. This pattern has two candles: the bullish candlestick and the bearish candlestick. For illustration purposes, assign the red bodied bearish candle Day 1 and the bullish candle Day 2. 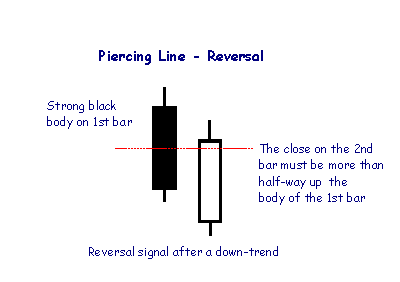 A piercing line pattern occurs when the green bodied Day 2 bullish candle closes the trading day above half of the Day 1 bearish candle. The price gaps down then filled to compensate the trading losses previously incurred in Day 1 bearish candle. The bullish market emotion can be read from the fact that the bulls on Day 2 reject the gap and push further into the previous bearish Day 1 losses. The rejection of the gap up by the bulls is a major bullish sign, and the fact that bulls were able to press further up into the losses of the previous day adds even more bullish sentiment. To confirm the consistency of the piercing pattern, more bullish trend is normally experienced before a buy signal is issued. This pattern signifies a buying momentum that is generally slower. It’s a typical bearish reversal pattern. The candle stick arrangement in this pattern consists of a long green bodied bullish candle followed by red candle. The bearish candle opens at a price higher than the previous bullish candle close. The bearish candle then plunges deep into the bullish candle’s body. The dark cloud cover is a sign that lower prices are coming up.  Its appearance is interpreted to mean an up-trend. The market emotion conveyed by this candlestick pattern is that of an excited and energetic market. Consistent with other indicators, this pattern is signals a strong downward move and the deeper the red candlestick penetrates into the green candlestick, the more likely the trades made based on the dark cloud cover will succeed. This is a bearish reversal pattern. It indicates that after making new highs, the price pattern has changed. It is represented by three candlesticks with the middle or second candle being small also referred to as the star. The first warning that the trend is taking a downward plunge or that the bulls are losing steam is given by the star. This trend is popular among traders for its reliability as a change signal. It is advisable to trade immediately after the pattern has closed. To set a reliable profit take target however another technical or fundamental analysis tools have to be considered in addition. This is pattern signals that the trend has changed after making new lows. 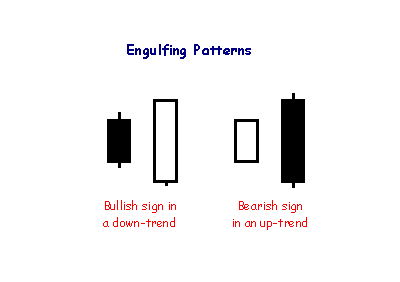 It is categorized under bullish reversal patterns. This pattern like the evening star consists of three candles. The first candle is red followed by small bodied green candle then a long green candle follows. The small candle signals market indecisiveness or bear exhaustion. 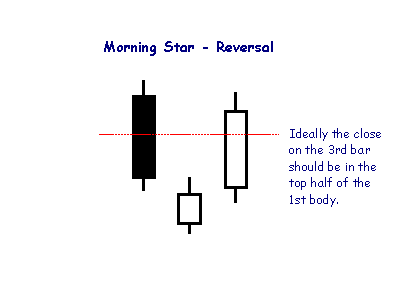 The morning star gives a strong indication of a major market low. To trade this pattern, a trader is advised to wait until the pattern closes. After consulting and interpreting other results of technical analysis, the trader can take then a long position. This pattern gives an indication of a reversal. It is made up of two candlesticks red and green bodied candlesticks. 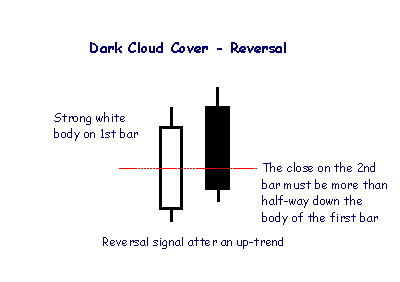 Since it is a reversal, an engulfing pattern can be either a Bearish Engulfing Pattern or a Bullish engulfing pattern. In the event of a bullish engulfing pattern which occurs in a downward trend, the green candle’s body completely penetrates the previous red candlestick’s body. The Engulfing Pattern occurs where the red candlestick completely submerges into the previous green candlestick. The rationale behind this pattern is that either the bulls or bears are losing momentum during the first candle and the opposite (bear or bull) makes a strong run in the second candle which as we saw could either be red or green depending on the first candle. Appoint to note here is that the market has to be in a clear identifiable position prior to the occurrence of the Engulfing pattern. Also the candle body sizes matter a lot; the bigger the difference in size between the two candles, the more significant the reversal point is. For one to trade, they should ensure that the pattern has closed and confirmation should be made that it is truly an Engulfing pattern before one can trade it. In summary, these are the most reliable and consistent candle stick patterns. Remember before you enter any trade based on a given pattern, the occurrence of the pattern has to be established to avoid using inappropriate trading strategies. Nice article..i think the Hanging Man and the Hammer also deserves a place in top 5 alongwith the Doji's....i may have had put either the Hammer/Hangingman /Doji ahead of the engulfing patterns as they play a big part in my trade entries/exits ...just my personal opinion. I would have to agree 100% Ammeo! I am trading off of hanging man & inverted hammers exclusively and making mega pips. The hanging man and hammer are the most important. BTW if you merge each of the multi candle patterns discussed here you end up in either the Hanging Man or the Hammer. The multi candle patterns discussed are simply the Hanging Man and the Hammer on a higher time frame. Which time scale do you use them in GMan? Those 2 reversal patterns are powerful & can be seen playing out on any time frame, many times with absolutely no draw down other then your spread. Important to remember that a hammer, etc., only becomes a usable signal when price moves slightly beyond its extreme. That is, wait for price to go at least one tick above a hammer to enter the trade; otherwise like crossing street without looking. In summary, these are the most reliable and consistent candle stick patterns. Thanks for the explanation of these patterns. But, how do you conclude they are reliable and consistent? Do you have any data to back up your claims? Trading via Japanese Candlestick analysis or patterns without market context is poor trading and will result in poor results (not reliable). Simply, you should already understand the price action and understand the direction of the price action prior to the appearance of any candlestick pattern. My point, traders that have good results via Japanese Candlestick patterns, that's a trader that is doing a lot more than just Japanese Candlestick analysis. Thus, Japanese Candlestick analysis is not the only thing that the trader is doing and is trader with a complete trading plan. How come? Such a test would be easy to do. WRB states that context is most important. If so, could it be that in fact these patterns have absolutely zero use? If the patterns did have any use, or any significance, the variable of 'context' would be of less importance. Whats more, if making money was as simple as spotting such patterns, success in the markets would be easy, and there would be little use for money management. If context is so important, could it be that any pattern of price variables are not important? This would imply perhaps that volume, previous highs/lows, and sentiment are the only drivers worthy of consideration. Market context is just part of the equation. You can't trade successfully on market context alone. Thus, you still need "something" to tell you its time to enter the trade and its time to exit the trade...market context does not do that. Therefore, Japanese Candlestick patterns or any other pattern do have value as entry/exit signals. Yet, alone without market context and without a complete trading plan...its not reliable. Also, there are lots of researchers, online articles, several books and several websites WITH statistical results. Thus, to say they NEVER come with statistical results is absolutely not true (an illusion) considering a quick google search brings up the information (e.g. stats by Thomas Bulkowski). Regardless, if anybody is wondering if Japanese Candlestick patterns can be traded alone profitably without market context, without a decent trading plan...the answer has been and will always be a big NO and the statistic results varies from one person to the next person (reliable and not reliable) depending upon each person's personal trading plan. Yet, with discipline, money management, positions size management, proper trade management and other key variables...Japanese Candlestick patterns is a great tool and reliable. My point, there are so many variables that traders have...its the trader responsibility to figure out a good trading plan to put all these pieces together so that they work well together as a team (trading plan) and Japanese Candlestick patterns are just one piece of the puzzle if you choose to use them. With that said, anybody that has a good recognition of these patterns can spot them...that much is true. Yet, it has already been proven here at TL alone by several so called "top programmers", naysayers and even supporters of candlestick patterns can not even properly identify many patterns. Anyways, once someone truly learns how to identify or code these patterns...doesn't imply they know how to properly trade them. Learning how to trade is the trader's responsibility...not the responsibility of the pattern. A candlestick chart is a style of bar-chart used primarily to describe price movements of a security, derivative, or currency over time. It is a combination of a line-chart and a bar-chart, in that each bar represents the range of price movement over a given time interval. It is most often used in technical analysis of equity and currency price patterns. They appear superficially similar to box plots, but are unrelated. Yet put them together and you have the secret sauce. Assuming the trader can define them properly in the first place.